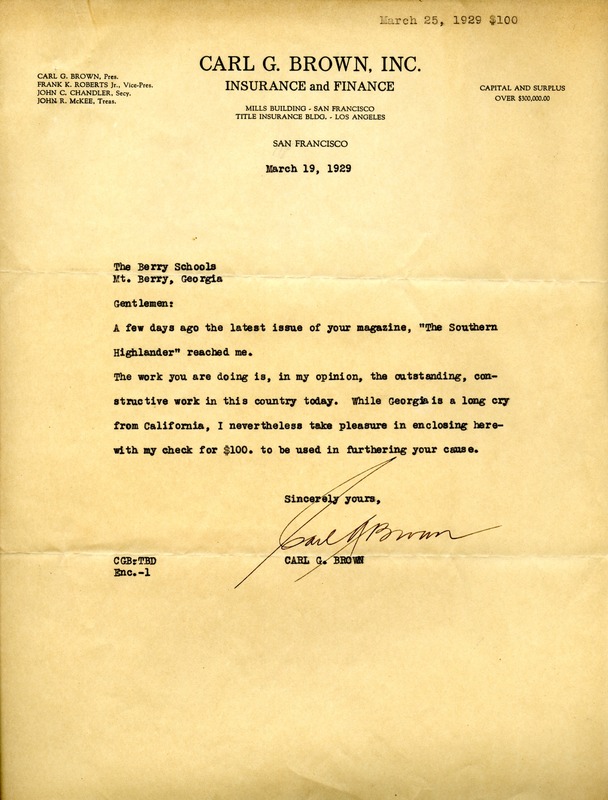 Letter to The Berry Schools from Carl G. Brown informing Miss Berry that the newest issue of The Southern highlander reacher him and that he believes her work to be some of the most constructive in the country. He also informs her that inclosed is his donation of $100.00 for the purpose of furthering her cause. Carl G. Brown, “Letter to The Berry Schools from Carl G. Brown.” Martha Berry Digital Archive. Eds. Schlitz, Stephanie A., Haley Fortune , et al. Mount Berry: Berry College, 2012. accessed April 18, 2019, https://mbda.berry.edu/items/show/9617.